Home / All About Baseball / Major Leagues / What Are The Twins Going To Do With Park? What Are The Twins Going To Do With Park? Byung Ho Park‘s career in the major leagues has been an interesting one. The Minnesota Twins signed the Korean slugger to a 4-year $12 million deal with an option for a fifth year, after winning the negotiating rights for $12.85 million in the last offseason. Park, 30, had a difficult start to the 2016 season with the Twins, but started to turn it around a bit in May, but headed in the wrong direction. The decline eventually led to his demotion to Triple-A Rochester in July. It was discovered that Park had been dealing with thumb/wrist issues which could have caused his lack of production. It inevitably led to him having season-ending surgery in August. In news that was a bit surprising during this offseason, the Minnesota Twins designated Park for assignment. The move came shortly after they signed relief pitcher Matt Belisle and needed to clear a spot on the 40-man roster for him. The next couple days after that move, rumors were swirling around about the Twins trading Park with Tampa as a possible landing spot, but the $9 million remaining on his contract made things a bit more difficult. Minnesota then outrighted Park to Triple-A. That leads us to present day. Park was at Twins camp at the start of spring training and it looks like there are no ill effects from the surgery. In the six games that he has appeared in so far he is hitting .400 (6-for-15) hitting a double and two home runs. The Twins would love Park to bring the power he had playing for Nexen Heroes in Korea (173 in four seasons, hitting over 50 the last two) to Target field. The two he has hit so far is promising but it is a very small sample size. So what’s next for him? Ultimately with his non-roster invitee status at camp, Park is working towards getting put back on the 40-man roster. With his projection being at first base and designated hitter, he has his work cut out for him. The Twins really like Kennys Vargas to be the DH and will give him a long look. First base is occupied by Joe Mauer so the options for Park in Minnesota are limited. Vargas, who is four years younger, is having a dreadful spring so far, going just 1-for-13 in six games. 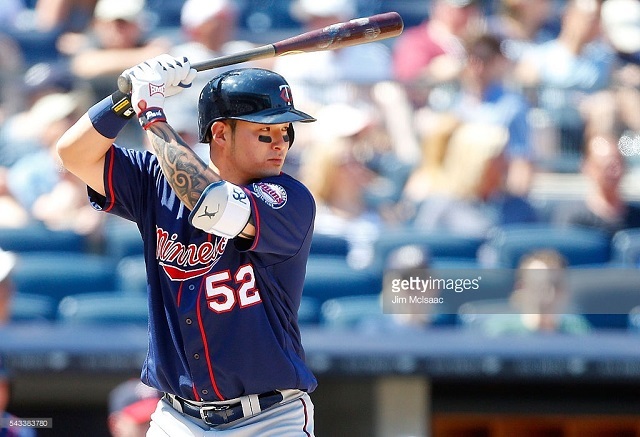 In 2016 with the Twins, Vargas had a hitting line of .230/.330./500/.833 which was certainly better than Park’s .191/.275/.409/.684 but played in fewer games. Both players are battling for one spot so one will be the odd man out. Based on experience and how it’s going so far, Park looks to be the favorite, but I don’t pretend to know what goes through the minds of MLB front office. There is still plenty of time before the season starts and it is expected that a decision will be made soon. Trading Park is certainly an option, but buyers will limited and hesitant based on the money owed, injury concern, and an alarming strikeout rate. We saw this offseason how difficult it was for some hitters to find jobs, and there are still a few out their looking so it may be difficult. Minnesota could also let him fester in the minor leauges on a “wait and see” approach to see if he’s healed fully from surgery and bring him back to the twin cities at a later date. Either way it will be interesting to see what they decide to do if Park continues to produce this spring. Next Story → 2017 New York Mets, World Series or Bust?